Many people turn to diet pills when they are looking for support during weight loss. Diet pills can assist in weight reduction efforts via different methods that may include appetite suppression, enhancing metabolism, blocking fat absorption, and so on. Not every diet pill works the same, so it’s important to know how the different products work. With this knowledge you will know what type of an effect they will have on your body and how they will aid you in your weight management goals. These pills shrink your appetite, so that you feel less hungry throughout the day. They can also make you feel fuller faster. They make it easier for you to follow a low calorie, low portion diet. As the name implies, fat blockers prevent your body from absorbing a percentage of the fats from the food you ingest. These fats are eliminated from the body before being metabolized. This stops you from storing additional unwanted fat, so you can burn off what has already been stored. These work very similarly to fat blockers, except that they block the body’s absorption of carbohydrates. They prevent carbs from converting into glucose and being stored as fat. The carbs are expelled from the body as waste during the digestive process. Pills with ingredients that burn fat boost your metabolism rate and eliminate stored fat. This fat burning process is accelerated when you exercise. While these diet pill ingredients can be very effective, they are developed to work and provide optimal weight loss results when they are combined with diet and exercise. Thus, diet pills with quality formulas work when used in conjunction with a modified diet and a daily exercise program. They help you to create a healthier lifestyle so you can better manage your weight, not only during your dieting process, but also once you have reached your targeted fat loss goals. Diet pills can make it easier for you to modify your diet, so you can make more appropriate food choices that include foods with lower calories and fats, as well as reduced meal portions. At the same time, they can provide you with the motivation you need to stay active, so you can establish and sustain exercise routines that are right for your body. Talk to your doctor to find out the best diet pill ingredients for you. What are the best diet pill ingredients? This is a common question that many dieters want to know. The ideal method for finding the answer to this question is to conduct your own research and consult with your healthcare provider. Read other customer diet pill reviews. When you have found a certain type of prescription or non-prescription diet pills that capture your interest, find out what the users of these products have to say about them. Consumer reviews can provide you with lots of great information related to the experiences users have had when taking these pills. You can find out what side effects they experienced, how much weight they lost, if they recommend it, etc. Just remember that consumer reviews are biased and based on opinions, so it’s important to read several reviews and look for the similarities among each to gain a realistic interpretation. After all, not everyone reacts to treatment in the same way and not everyone takes pills as they are recommended. Learn about the individual ingredients (both active and non-active) to find out what they do. You need to not only discover how the ingredients work, but the dosage of each ingredient per pill. This is important in terms of both efficacy and safety. For instance, green tea is a proven weight loss ingredient. However, a lot of diet pills use so little of it that it won’t work effectively, as you need a certain amount of green tea for it to have any impact on weight loss. Likewise, when it comes to side effects, look for certain ingredients like stimulants. While some products have been properly formulated and use stimulants in a reasonable and safe amount, others may contain more than one stimulant ingredient, which can increase the risk of side effects if the dosage of these substances is too high. Many products that claim to have the best diet pill ingredients will say that the ingredients in their formulas are safe and have been clinically studied. Don’t just take their word for it; investigate if studies have actually been done. If the ingredients have been studied were humans used as test subjects, or were the effects only observed in animals? Furthermore, were the ingredients studied for their effects on weight loss or for another purpose? Some research will even reveal proof that there is no weight loss benefits linked to the studied substances. Therefore, be sure to get the facts. When it all comes down to it, only you and your doctor can determine what best diet pill ingredients will most effectively meet your weight loss needs and goals. 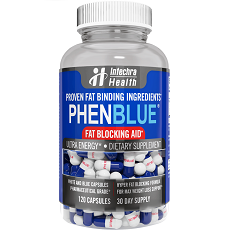 PHENBLUE® with 7-Keto combines PATENTED FAT-FIGHTING NeOPUNTIA with ENERGY ENHANCEMENT for ultimate weight management support in a single capsule. 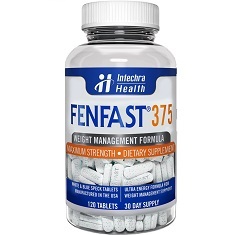 FENFAST® 375 gives powerful FAST-ACTING ENERGIZING BENEFITS and THERMOGENIC SUPPORT combined with metabolism enhancers for complete weight management support.